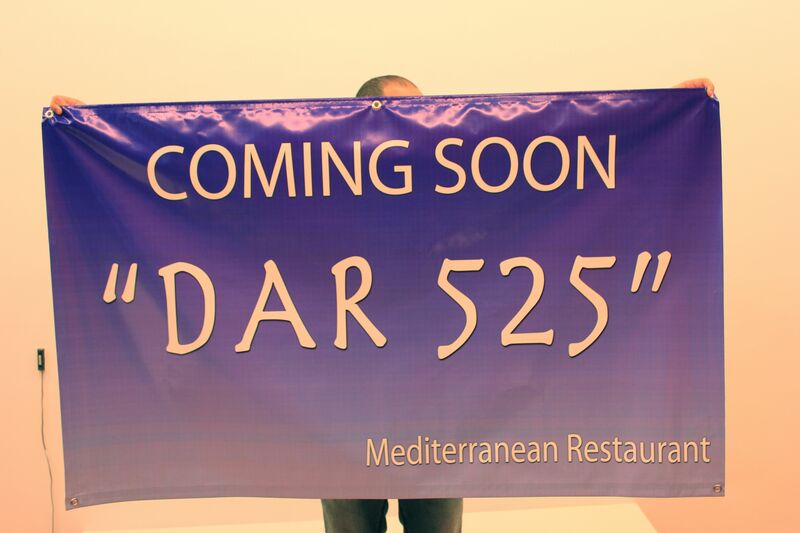 Check out the ‘Coming Soon’ we printed for a new Mediterranean restaurant which will open up soon in Brooklyn, NY. Looking forward to some great meals. Categories: Satisfied Customers | Tags: Banners, Brooklyn, Restaurants, Williamsburg | Permalink. Was in the neighborhood with half a dozen friends and we picked this place to walk in to, and I’m glad we did. We sat down and started off with 2 big salads, scrumptious mussels and hot pita bread and hummus, along with sweet vodka cocktails. For dinner we munched on shrimp and calamari pizza (on whole wheat, as we specified), fried tilapia which was the perfect crispness and chicken in a date and apricot stew that was sweet and savory. Somehow we had room for dessert and had baklava and banana crepes. By the end of the end our bellies were more than content. And the restaurant itself is quite big and spacious, I’m happy my group was seated right away. Unfortunately I’m not in Brooklyn that often, but next time I’m by Grand St, I can’t wait to come back here, Dar 525 is certainly a great place to grab a bite. I ate at DAR 525 the first night they opened with a couple of friends. They didn’t have air conditioning so we sat on the street in a charming, semi-enclosed space that gave a sense of privacy while still being open to the cool breeze. The food was excellent,eggplant salad, babaganoush, fresh baked pita and amazing baklava (also home made, not broght in). Service was friendly and efficient. The only problem was the landlord’s dog barking very loudly from the basement just outside the window. Poor doggie! Definitely a great new addition to the neighborhood restaurant scene.